The impact of the Malibu design was magnified by the footage shot for Ampol being shown in cinemas and subsequently in Surf Clubs. With huge demand for the new boards and no established supply of balsa wood, compounded by a lack of technical experience with fibreglass, the Malibu design is constructed with the current hollow board technology. The Racing Sixteen builders, principally Gordon Woods, Bill Wallace, Norm Casey and Barry Bennett in Sydney and Frank Adler in Brisbane, adapted Tom Blake's Hollow Board design of plywood sheets over a strutted timber frame to Malibu dimensions, the result known as the Okinuee. Image right : Gordon Woods' Velzy-Jacobs fibreglassed balsawood Malibu surfboard, purchased from Bob Burnside (right) and his first plywood copy. 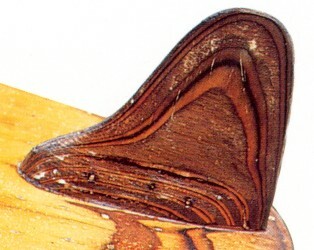 The principle of determining rocker by putting a curve in the bottom centre strut in the board, although limited, was already established. Other design requirements were more problematical. Curved profile rail shape was a feature on the Solid wood boards of the 1930's, but the Racing 16 used an easily constructed square rail. The Okinuee required the outside rails to be cut of oversized timber and then fixed to the central struts. Crossbeams and solid nose and tail sections completed the frame. Plywood panels were then fixed, mostly with screws and glue, and a draining plug added. 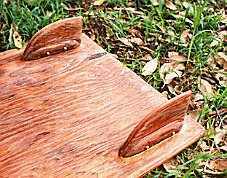 The solid rail sections were then shaped, much in the manner of the laminated solid wood boards manufactured in Hawaii and mainland USA in the later 1930's. The addition of the fin was a major structural difficutly, since it was invarriably added after the board was constructed. Most common seems to be mitred into the central strut and held mainly by glue and nails. Some designers were more structurally adventerous and incorporated side supports, a precedent for the use of fibreglass rovings to add side strength to the finbase in the 1960's. Okinuee - Hollow malibu board adaptation. Note base support and nails. Hand-painted Okinuee Nose Decor, 1957. Book title reads How to Ride the Waves. Although a relatively large number of these boards were built by an emerging group of manufacturers, board construction was still carried out in backyards and at Surf Clubs. The materials were easily acquired and some surviving examples are probably home made. Likely examples noted usually with limited, often square, rail profile. A suprising number of these boards still exist, given they were in general production for not much more than twelve months. Note ANMM # 00001230 and several examples at Brian Jackson Surfboards, Carringbah, NSW. By the end of 1958, regular shippments of balsa wood were available and the focus was on learning the new (fibreglassing) and relearning the old (handshaping). Boat Plans Pty. Ltd. produced a set of construction plans and instructions for the "Okanoie" in 1957. This was not to be the case in New Zealand were the design specifications were quickly absorbed but the development of a locally produced fibreglass board was still some years away. 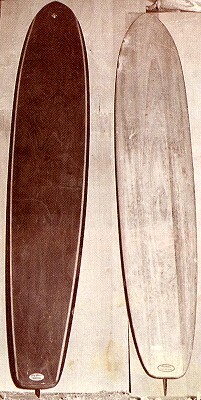 Based on the Malibu board (see Okinuee, Australia) it featured a wide square tail, narrow rounded nose and a standard D fin set right at the pod. Thanks to Tony Reid, New Zealand. The Okinuee also had a further overseas influence. 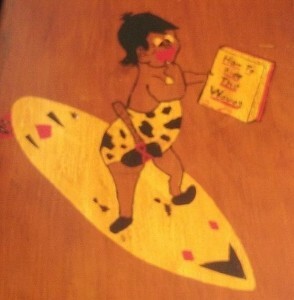 Reginal C. Blunt, a noted South African Surfer puchased an Okinuee board from Australia, circa 1959. It is probable that the board was manufactured by one of the early Sydney builders. Plate 30. Reginald C. Blunt with new Australian board at Durban, South Africa. Image and caption Patterson,1960, page 111.